New England definitely has four separate seasons. But, when the challenge came through for seasons, I immediately thought about seasonal flowers. 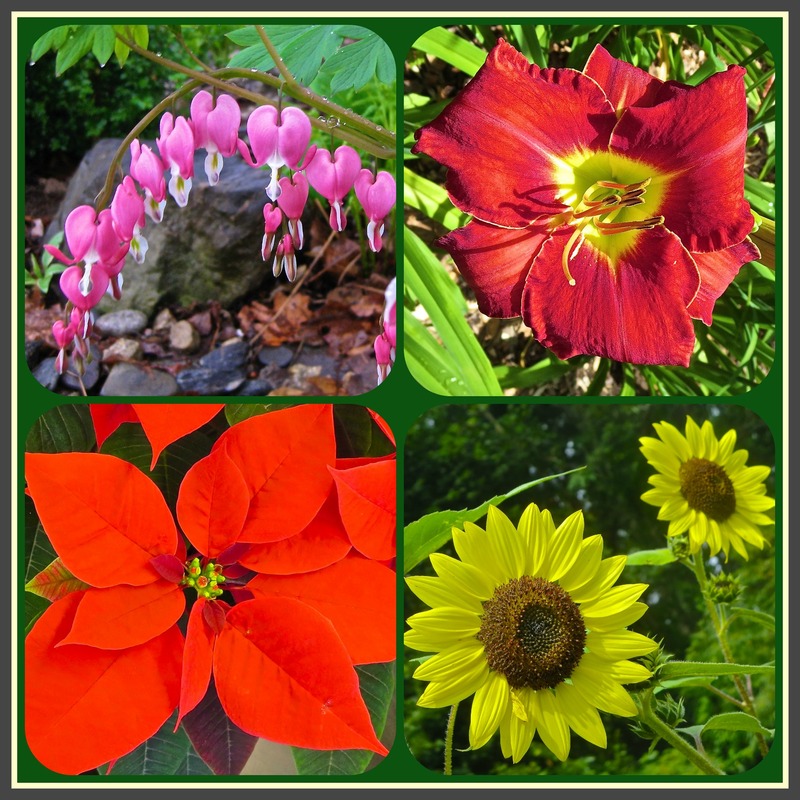 I love spring flowers like Bleeding Hearts, have beds full of Day Lilies, appreciate the beauty of giant Sunflowers, and enjoy Poinsettias during the holidays. I’ve been reminded that flowers can’t be eaten so why grown them. My response is flowers feed my soul. I hope they do yours too. Linked to the Weekly Photo Challenge: Seasons. This entry was posted in New England, Photography, Weekly Photo Challenge and tagged Bleeding hearts, Day lilies, Flowers, Gardening, Photography, Poinsettias, Seasons, Sunflowers, Weekly photo challenge, Weekly Photo Challenge: Seasons. Bookmark the permalink. You made a great selection Judy! Life would be pretty boring if we only grew what we can eat. I think you’re right, they feed our soul. That’s exactly my response to why I grow flowers and buy them for the house in winter. My soul needs them! SO pretty! If I could, I’d have fresh flowers every day. Thanks for these. Flowers feed our soul! Beautiful! They feed your soul because you feed them! It seems like everything you touch turns to gold – and pink and red and yellow! You have a wonderful talent for creating beauty from dirt! Boy, would my window boxes breathe a sigh of relief when they saw you coming! This confirmed foodie thinks that food for the soul is just as important as food for the body. I always enjoyed perennial gardening over vegetable gardening. There’s something about flowers that make me smile or as you say ‘feeds the soul’. Flowers are nourishing. Hope the snow is gentle and soon gone. I love the four photos, wonderful color. And don’t forget that some flowers feed the stomach as well as the soul. Spring is coming! Just might not be as soon as you wish. I agree 100% — flowers feed my soul! Thanks for sharing yours. This was a most perfect entry from you for this weeks photo challenge! The collage and the different flowers for each season! PERFECT! “The Seasons of New England Flowers” sounds like a great book, Judy. Photos framed in a perfect arrangement as you presented would decorate a kitchen or lined along a shelf in oak frames. “Flowers feed our souls,” so true!